President Donald Trump reacted with surprise on Monday to news that motorcycle maker Harley-Davidson decided to move some of its manufacturing overseas in response to hefty European Union tariffs. The president urged other companies to exercise forbearance as his trade strategy plays out. The European Union raised the tariff on Harley Davidson motorcycles from 6 to 31 percent as a countermeasure to Trump’s tariffs on steel and aluminum. That adds approximately $2,200 to the cost of a motorcycle. The company said in a regulatory filing that it does not plan to increase prices as it adjusts to the tariffs. “In the near-term, the company will bear the significant impact resulting from these tariffs, and the company estimates the incremental cost for the remainder of 2018 to be approximately $30 to $45 million,” the company stated in the filing. 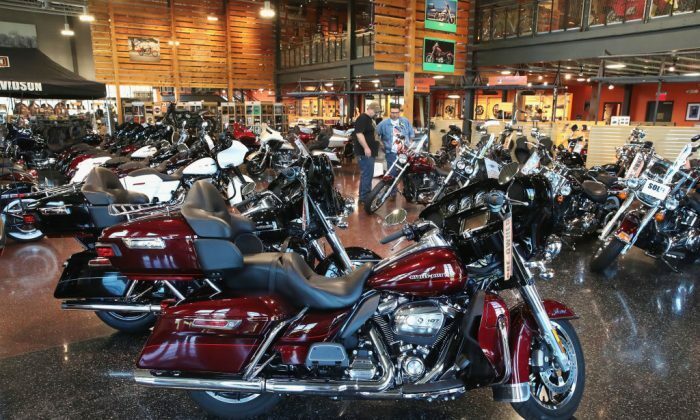 When calculating the full-year impact from the EU tariffs, Harley Davidson said it estimates the amount to be approximately $90 to $100 million. The company did not mention whether any jobs were at risk due to the move. They are based in based in Milwaukee, Wisconsin, and employ more than 6,000 people globally. In the filing, the motorcycle maker stressed that increasing international production to alleviate the burden of tariffs was not the company preference. The company defended its decision by calling it the only sustainable option to maintain a viable business. In 2017 alone, nearly 40,000 riders bought new Harley-Davidson motorcycles in Europe. The company said the revenue generated from the EU countries is second only to America. Epoch Times reporter Bowen Xiao contributed to this report.